Far from the crowds and condos...far from the noise and tourist traps...there is the old Hawaii of HANA. A small community overlooking beautiful Hana Bay on the windward east end of Maui. HANA is cooled by the tradewinds that blow across the blue Pacific and nourish us with evening rains and make this part of Maui lush and tropical. As you travel the magical "Road to HANA" you leave the real world behind and slowly enter the land of old Hawaii with waterfalls, majestic coastal views and jungle rain forests. 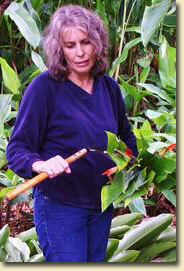 By the time you arrive in HANA you will sense a slight change. You will feel a slower pace, more peaceful and quiet. There are no shopping malls, night clubs or high rise resorts. Hana is not for everyone, but for those looking for romantic seclusion and outdoor adventure Hana may be the place of your dreams. Experience old Hawaii with a cultural interpretive hike with the Kipahulu Ohana at Kapahu Living Farm at Haleakala National Park in Kipahulu. Visit Ka`eleku Caverns, one of the largest lava tubes in the world. Hang Gliding Maui offers powered hang gliding flights above Hana. Kahanu Garden offers tours of 472 acres encompassing plant collections from the Pacific Islands, concentrating on plants of value to the people of Polynesia. 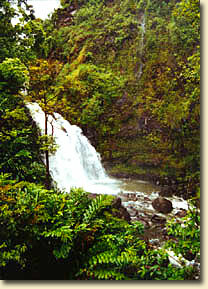 Kipahulu District of Haleakala National Park includes the famous Pools of Oheo. East Maui Taro Festival is held annually in the spring. Kayak, snorkle, surf and freedive at Hana Maui Sea-Sports. At the Hana Cultural Center and Museum, tour a replica of a traditional Hawaiian village, gardens, the 'Hana Lockup' — an 1871 historic courthouse and jail — and a museum on the history and culture of the Hana coast. Call 248-8622. Nearby Waianapanapa State Park has a black sand beach, blowhole, legendary fresh water cave, and picnic area. Hana Ranch Stables have One hour trail rides: coastal and mountains, call 248-8211. Hana Productions offers photo/video production management and scouting, concierge services, adventure tours, digital services, and more. Call East Maui Towing if you need road service on the Hana Highway. Maui My Way - a guide to the best Maui vacation activities and experiences.